he Greek Goddess, artemis, is very complex. She personifies opposites. She is seen as a virginal moon goddess, however, She is a goddess of fertility and childbirth. She was a fierce hunter, who could kill with one shot of her arrow; yet, She fiercely protected the animals of the forest and woods. She is said to be born of Zeus and Leto. At the time of her birth, Leto was very weak, and so, it is told that She helped birth her twin brother, Apollo. Due to this, she is a Goddess of Fertility and Childbirth, a force of creation. Women in childbirth would pray to her for the safety of their children and of themselves. As a child, she was asked by Zeus what she wanted for her birthday. She replied that she wanted a bow and arrow, like her brother; She wanted to bring light into the world, and She wanted to live her life free from love and marriage. She valued freedom above all else and refused to conform to convention or the traditional roles of women. She was quick to anger if any man would look upon her. Aktaon was found spying on her, unclothed, while she bathed. In Her anger at his behavior, she turned him into a stag. His hunting dogs, not knowing it was him, tore him apart. As a bringer of light into a dark world, She is often portrayed carrying a torch or a candle, always lighting the way for others. She nurtured the needy and protected the weak. As She defended the people against the patriarchy of the Olympian gods, She was an early feminist and is invoked by some of today’s Goddess feminists, most often in her guise of the Roman Diana. She is portrayed always in the company of other women, bathing or roaming through the forest, which was Her domain. This domain is the home of two of her symbols, the bear and the stag. Her rituals were conducted within the forest and trees, under the sacred light of the full moon. The women, or nymphs that accompanied her, would run with here through the woods, as fast and sure as the deer. When they could not run from the men who chased them, they would call upon artemis for protection. One such woman was Daphne, who ran away from Apollo, the brother of artemis. She was in such fear of being captured and used by Apollo, that she called out to emis to save her, whereupon artemis transformed her into a laurel tree. Apollo was ever seen after that with a wreath of laurel upon his brow. Another, Arethusa, who also loved her freedom and roaming the wood, was running from Alpheus when she called upon artemis. She was rescued by being transformed into a beautiful spring of clear, clean water; as such she would still have the freedom to roam through the forest. Even though they looked to Her as the Goddess of War, She was worshipped as the many-breasted Mother Goddess of the Amazons at Her Temple at Ephesus, which was a Wonder of the Ancient World. She was served by the Melissa, the Bee Priestesses, who are also associated with Aphrodite, Persephone, Demeter and Cybele. As the Mother of the Amazons, she was called “Proto Thronia” – artemis, First Upon the Throne. She and her Temple were held as sacred. This is a portrayal of the Melissa, the Bee Priestesses of artemis. The Greek traveler and geographer, Pausanius said of Ephesus, “All cities worship emis of Ephesus and individuals hold her in honor above all other deities. This is due to the renown of the Amazons, , those who first consecrated the land of Ephesus, those who dedicated the first image of the Goddess before the Ionian Greeks arrived”. While some will state that the Temple at Pyrrichos in Greece belonged to Apollo, it was to artemis that the Temple belonged, as it was built to honor Amazons who had fallen in war. While emis was identified with Dyktynna in Crete, Britomartis in Minoa and Bendis, who rode a mighty horse through Thrace with her torch and spear, She is most identified with the Roman Goddess Diana. Diana, who was originally the Goddess of the open sky became the Huntress Moon Goddess of Rome. She also was worshipped only out of doors. Her name comes from the word “diania”, which means intelligence. She gives her name to Dianic Witchcraft, as founded by Zsuzanna Budapest. A ritual to emis would have your altar adorned with a green altar cloth and green candle to symbolize the forest. The Goddess candle, symbolizing artemis, would be white or silver. Some of the symbols you could include would be the moon, a stag or bear, or any other forest animal. As always, take a cleansing bath before ritual and cast a circle in your own tradition. 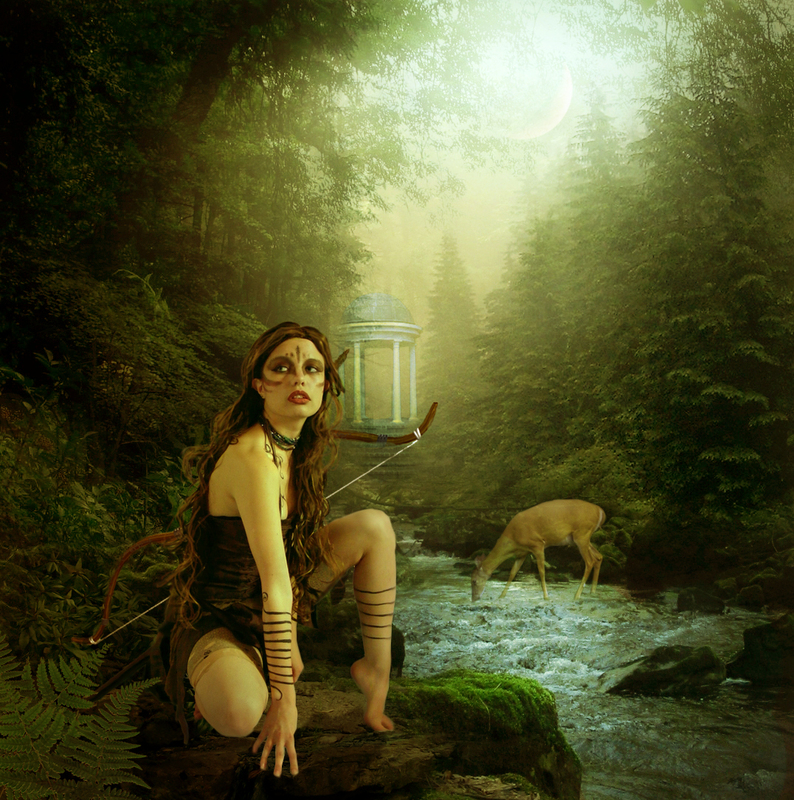 Breathe, meditate and focus on artemis and what you would ask of her. Light the white Goddess candle. When done, thank Her for Her presence and close your circle according to your own tradition. Silence. Only the sound of my breathing breaks it. Stillness. Only my fidgeting disturbs it. No stars are visible tonight. The moon covers its face with a tattered curtain of cloud. Ah there it is, flashing briefly in the distance. Wrapping velvety blackness around me like a cloak, I step out into the night & begin to walk. I am one shadow amongst many, & yet… isolated. I glance upward again. This time I fail to find it. I feel as far away from my goddess of choice as I do the hiding moon. I’ve been a self-dedicated priestess of artemis since roughly 2005. It should be easy for me to speak of Her;I feel odd that it isn’t. I don’t claim to have a complete understanding of the Athenian calendar system, but I try my best to incorporate as much of it into my spiritual life as I’m able & is meaningful for me. I’m aware of a couple of feast-days which honour artemis falling in the Month of April. On the 8th She is celebrated as an embodiment of all that’s feminine in Nature & protectress of women. On or around the 18th there’s a day which honours Her as an embodiment of the moon. I suppose it’s natural, then, for my thoughts to turn to Her at this time. I can’t help but notice a certain sense of duality in Her nature. This is shown from Her birth. Her parents are the Olympian Zeus & the Titan Leto. Her brother is Apollo, god of prophecy, healing, & music. As He took on some of the duties of the solar deity Helios, so did artemis take on traits of the lunar Selene. Sharing a bond closer than most siblings, the twins form 2 sides of the same coin. I am not a mother yet & I find it difficult to relate to this aspect of Her. I find it somewhat ironic that a virgin goddess preside over matters pertaining to childbirth & pregnancy. As artemis Kourotrophos She’s the ‘upbringer of young children’. As Lochia She becomes the patroness of pregnant women. One might think that artemis got an early start in these roles. Her arrows might bring death to Her prey, yet She is equally capable of creating life. A jealous Hera cursed Leto, saying that no land would shelter her when her time came. Zeus raised the island of Delos for her. artemis was born 1st & was able to assist Her mother giving birth to Her twin. artemis favours mountains & wild places. As much as She seems to value Her solitude, She is also deeply loyal to those She cares about. artemis & Apollo slew the children of Niobe, wife of the King of Thebes. Once she boasted to to Leto, the divine twins’ mum, that even as a mere mortal she had bore more children & therefore was superior than the Titan. Apollo heard of this & became violently insulted. He told artemis, who helped him hunt down all Niobe’s children. Apollo shot & killed all the males; artemis took down all the females. She has always strongly defended Her sense of self & principles. She is fiercely protective of Her virgin status. Spare a thought for the hunter Aktaion’s tragedy. He has the misfortune to accidental stumble across the goddess bathing in a river. A snarling emis immediately transformed him into a stag, which was ripped apart by his own dogs. Harsh! However, this isn’t to say She’s entirely without compassion for men. Although immune to the goddess of love Aphrodite’s charms, emis came to greatly admire the hunter Orion. Orion was also seeing goddess of the dawn Eos on the side. Apollo grew concerned that His sister’s chastity was in danger & that She would be used as Eos was. In the end the archer god sent a giant scorpion after him. Orion attempted to swim to the island sanctuary of Eos in hopes that She’s protect him. In one version of the myth Apollo conned emis into an archery contest, betting that She couldn’t hit that little speck on the horizon. Never one to refuse a challenge, She hit Her mark & put an end to Orion & the threat he posed to Her virtue. artemis possesses the surety of the arrow. Her sight is true. Her aim is steadfast. She challenges each of us to stay true to our core selves & to demand nothing less than the right keep to our ideals & goals. Remember Her dual nature, though. Balance temper or stubborn pursuit with compassion, passion with reason. Above all, seek Her. Look for artemis in green & silent places. Ask that She bless you with Her presence & let you walk beside Her for a time.